The Beauty Scoop: NuFACE Mini: We tried it...and loved it! 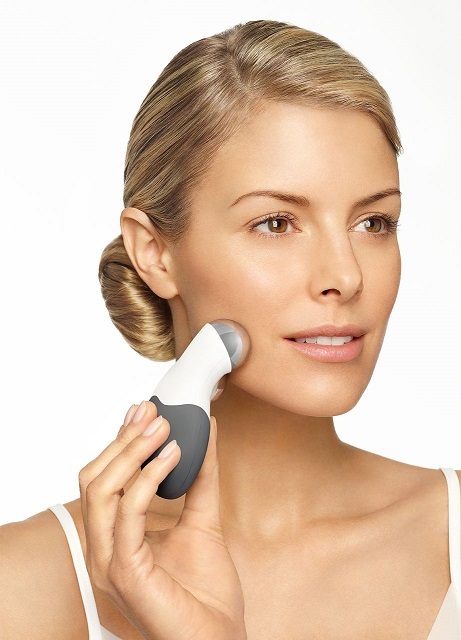 Recently, we were given the incredible chance to try the NuFACE Mini at our office. This week, our General Manager shares her thoughts on this breakthrough device. I am a single mom in my mid-thirties and I have spent most of my life fascinated by the new and upcoming beauty products and devices. I live a very active and busy lifestyle. I am always on the go and don’t have a lot of time or extra money to spend on luxurious spa treatments. I think most women have something they would like to improve in regards to their skin. I heard about the NuFACE Mini and although I was intrigued at first I was also very skeptical. Will this really work? After doing my research and reading other reviews online I decided to give it a try!!! I will be honest when I opened the package… I was nervous and unsure if I really wanted to try it. The first thing I noticed is that I had to let it charge over night before I could actually use it. It turned out to be a good idea because I was able to read all the directions thoroughly. The next day I pulled it off the charger and was ready to attack and tone my face! I applied the NuFACE Gel Primer all over my face and began using the device as the directions instructed. At first I didn't feel anything and wasn't sure it was working. All I heard were beeps but didn't actually feel anything happening. Until a few minutes later I felt a small shocking sensation! It didn't hurt but scared me enough to stop using it for a moment. I realized that I had lathered my entire face with the gel primer in the beginning and by the time I finished my first section of treatment the rest of the gel primer had already dried. Note to self…apply NuFACE Gel Primer only on the sections you are treating at the moment and when you move on to another section, apply again. I only felt the shocking sensations when the primer was dry. It was easy to use and I felt really good about my results. I could literally see the difference in my cheeks immediately. Similar to the effects you get when using highlighters and bronzers except way better! I continued to use it for about 5-10 min a day for a few weeks and every time my results were more and more noticeable. After the first week I decided to try one of the serums to see if they added any other positive benefits. To my surprise the NuFACE Nourisher Superfruit Stem Cell Serum is like magic in a bottle. After only one use my skin felt amazing! You know that glow you get when you’re expecting? That is how my skin looks every time I used this serum! Overall I would highly recommend investing in the NuFACE Mini! The device is small and easy to take with you when you’re on the go. It only takes about 5-10 minutes a day to see instant changes and it’s way more affordable than Botox! FREE GIFT OFFER! Receive a free NuFACE Creme Primer ($20 Value) when you purchase a NuFACE Mini Device!